PAMECA V | Training on Investigation Techniques for Security Academy students. Training on Investigation Techniques for Security Academy students. Home News Training on Investigation Techniques for Security Academy students. 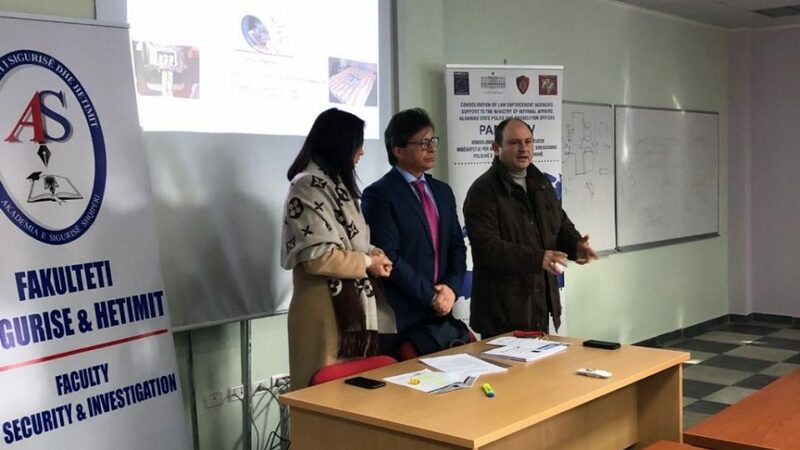 PAMECA V Organised Crime International Junior Expert conducted a training for the students of the Faculty of Security and Investigation, Security Academy, on January 21st. The training was designed in line with PAMECA V work plan sub- activity “Support to the Security Academy cadets on Investigation Techniques” and it was attended by 77 third- year students. It provided capacity- building support in an effort to enhance the fight against organised crime, which represents a growing challenge for the Albanian law-enforcement agencies. The training module included information on forms of organised crime groups, organised criminal activities and characteristics and proactive techniques of preventing and tackling this phenomenon. The provided information strived to share knowledge and best European experience in this matter with the aim of enhancing the skill level of judicial police officers who deal with organised crime cases.